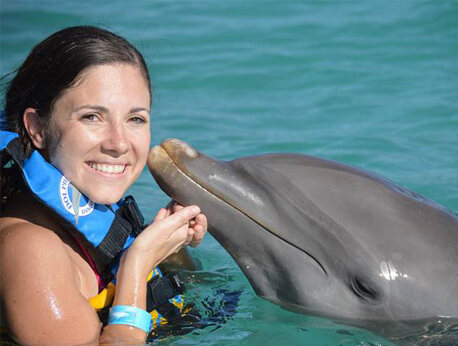 The Dolphin Encounter is a one of a kind experience that enables you to personally interact with some of the smartest marine animals on the face of the planet. During the program, you will be able to see the dolphins at home in their natural habitat. You will be able to swim with them, pet their skin, and kiss them if you so desire. It will be a day you are sure to not soon forget. As one of the quieter islands in the Caribbean, Anguilla is an idyllic and near perfect location for a natural dolphin habitat. Dolphins are not only adorable creatures to watch, they are extremely smart and comfortable around people. This has allowed the great team at Dolphin Discovery to create a specialized tour designed just for people vacationing in this part of the Caribbean. The Dolphin Discovery Tour will leave you amazed. You will be afforded ample time to watch and interact with the dolphins that call this area of Anguilla and St. Martin home. One of the most unique features of this tour is that it is truly suitable for all age groups. Everyone in your family will enjoy their surroundings and the time to explore one of the most beautiful ocean habitats in the world. As one of the smartest marine animals around, you might just find that the dolphins teach you a thing or two about life and how to take care of your environment. The Dolphin Discovery Tour is offered multiple times daily. You will be taken to the area where the dolphins are, given a tour, and receive some educational information. While on the platform, you will be able to touch the dolphins, and even kiss one or two. It can all be captured with photos, so you will have special memories of the day. Photos can be purchased after the program ends. This is, after all. You will simply be amazed as the Dolphins dance and even sing all around you. The toughest part of this tour will be being told it is time to return back to your hotel. You will want to make note of the special regulations for this tour. Only biodegradable sunscreen is permitted in order to protect the dolphins and their environment. You will also want to bring your own towels to enjoy the day, and remember that there are many restaurants and shopping opportunities for you to further explore while on the island. Children must swim with an adult, and everyone is required to wear a proper life vest. Kids must be at least 3'11" to participate in this program and must be accompanied in the water by a paying participant 18 or older one on one. Remember to bring along your Passport and visa as it may be requested by the migration department when arriving to Anguilla. Consult your immigration office for further information. Anguilla-St. Martin groups have a maximum of 20 people to ensure a wonderful experience and greater interaction from a special underwater platform. Ferry departures are every 45 minutes. From St. Martin to Anguilla departures start at 8:15 a.m. and finish at 7:00 p.m. From Anguilla to St. Martin the first ferry departs at 7:30 a.m. and the last one at 6:15 p.m. The ferry schedule might change without previous notice. Dolphin Discovery is independent from the Ferry Company.